I have some great news to share: Peace Now - our sister organization in Israel - has succeeded in forcing the Israeli government to impose the rule of law and evacuate Migron, the largest illegal outpost in the West Bank. Yesterday, the Israeli High Court of Justice rejected the latest effort by settlers to prevent the outpost's evacuation, ruling that the outpost must be evacuated by next Tuesday, September 4th. Peace Now's victory on Migron is a victory for all of Israel and for all those who care about the causes of peace, democracy, and security. Help APN make sure that Peace Now can continue the fight. Continue reading Victory against the settlements!. Washington - Yesterday, the Israeli High Court of Justice rejected the latest effort by settlers from the illegal outpost of Migron to prevent the outpost's evacuation. The Court ruled that the outpost must be evacuated by next Tuesday, September 4th. Continue reading APN Welcomes Migron Ruling. Justices accept state's position regarding some structures, says those homes remain up until three months, until the veracity of the purchasers claims can determined. Israel must evacuate the West Bank outpost of Migron by September 4, the High Court of Justice ruled on Wednesday. 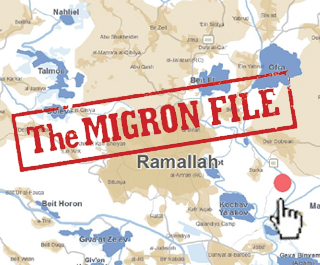 Continue reading Ha'aretz: High Court: West Bank outpost of Migron must be cleared by September 4. Alpher discusses Israeli Foreign Minister Avigdor Lieberman's motives for apparently declaring war on Palestinian President Mahmoud Abbas, and his view regarding if and when Israel should take the military initiative on Iran revisiting his set of criteria for determining whether it was wise for Israel to attack Iran's nuclear project. Continue reading Hard Questions, Tough Answers with Yossi Alpher - August 27, 2012. Yossi Alpher is an internationally renowned consultant and writer on Israel-related security issues. He served as an intelligence officer in the Israel Defense Forces, a senior officer in the Mossad, Israel's national intelligence agency, and as director of the Jaffee Center for Strategic Studies at Tel Aviv University. Prior to and during the Oslo peace process, Alpher coordinated several track II dialogues between Israelis and Arabs. He served as Special Adviser to Israeli Prime Minister Ehud Barak during the Camp David talks in July 2000. Alpher serves on the executive committee of the Israeli Council for Peace and Security, and is coeditor, together with Ghassan Khatib, currently head of the Palestinian Authority Media Center, of the bitterlemons family of internet publications, dealing with the Israeli-Palestinian conflict and broader Middle East issues. Alpher writes "Hard Questions, Tough Answers", a weekly Q&A for Americans for Peace Now. "Why don't you come spend Shabbat with us on our settlement, come to the synagogue and see for yourself that we don't have horns and there is no occupation?" I get such an invitation practically word for word every few months from settlers who wish to present the appearance of a normative, moral and virtuous community beyond the Green Line. Continue reading Ha'aretz: "Sugar-coated racism" by Peace Now's Yariv Oppenheimer. Q. ...how can Netanyahu emerge from this showdown with the United States and his own security establishment (on his approach to Iran) without losing face? Q. Does last week's appointment of ex-Shin Bet head Avi Dichter to civil defense minister help Netanyahu's cause with the Israeli public regarding Iran? Q. What do you make of the announcement...that Egypt is considering introducing changes in the military annex of the Egyptian-Israeli peace treaty...? Continue reading Hard Questions, Tough Answers with Yossi Alpher - August 21, 2012. With the 2012 election season in high gear, Iran hawks in both parties and their Israeli counterparts, including Israeli Prime Minister Netanyahu and Defense Minister Barak, are pressing for war. Continue reading Action Alert: Tell Obama to resist election year pressure to go to war on Iran. Washington, DC - Today Americans for Peace Now (APN) sent a letter to President Obama calling on the president to continue to resist election season pressures to abandon Iran diplomacy in favor of military action. The letter was signed by APN Chairman James Klutznick and APN President and CEO Debra DeLee. Continue reading APN Tells Obama: War with Iran is not a "Pro-Israel" Litmus Test. With the 2012 election season in high gear, we know that you are under increasing pressure to launch a war against Iran. We are writing to tell you that Americans for Peace Now (APN) - a proud American, Jewish organization whose mission includes supporting Israel and Israel's security - believes that such a decision is too important to be turned into election season political football. We urge you to remain committed to the responsible course of diplomacy, backed by sanctions, that is the centerpiece of your current policy. Continue reading APN urges President Obama not to give in to election year pressure to go to war against Iran. "Between Iran and a Hard Place: The Escalating Threat of War Between Israel and Iran"
Belligerent statements by Israeli Primer Minister Benjamin Netanyahu and Defense Minister Ehud Barak on the potential for war between Israel and Iran are fueling headlines worldwide and have triggered public debate in Israel about the viability, benefit, and price of such a conflict. As prospects for a preventative Israeli attack against Iranian nuclear facilities continue to increase, the implications for Israel, US foreign policy, and the Middle East in general have become more numerous and densely complex by the day. Join Israeli strategic affairs expert Yossi Alpher in a discussion of recent developments, including Secretary of Defense Leon Panetta's trip to Israel, the appointment of Avi Dichter as Israeli Home Front Minister, President Shimon Peres' comments opposing an Israeli attack without US assistance, and the leaked report of Israel's alleged attack plans. Alpher will also lay out a clear picture of how the hostile actions and rhetoric between Israel and Iran tie into Israeli politics, the Israeli-Palestinian conflict, Hezbollah, Syria, and Egypt. To receive a link of a recording made of the call, please email Alison Lynn at alynn@peacenow.org. Israeli officials may see a "zero hour" for attacking Iranian nuclear facilities, but it could backfire. Jerusalem Post: "Right wing urges PM to adopt Levy Report"
Politicians from the right and US Jewish leaders support findings; C'tee on Settlements to discuss Migron, Hebron and Beit El. "Peace Now executive director Yariv Oppenheimer on Monday said it would be a mistake for the Ministerial Committee on Settlements to formally adopt the report, which, he charged, 'contradicts Israel's international commitments'." Foreign Policy: "The Rise of Settler Terrorism: The West Bank's Other Violent Extremists"
"The rise in settler radicalism stems from several key factors: the growth of the settler population over the past generation, the diversification of religious and ideological strands among it, and the sense of betrayal felt by settlers following Israel's withdrawal from the Gaza Strip in 2005." translation provided by Israel News Today. Article not available online. Continue reading Yedioth Ahronoth : The New Settlers. Alpher discusses the controversy within Israel and between it and the Obama administration regarding the wisdom and timing of an attack on Iran: what would Israel gain? What would be the downside? Why are Netanyahu and Barak having so much difficulty in persuading the Israeli public that Israel should do the job, and soon, Why the Israeli civilian rear is such an important factor in Israeli calculations when it wasn't in the past, the odds of an early Israeli attack, and the strategic implications of Morsi's dramatic subordination of the Egyptian military to his authority. Continue reading Hard Questions, Tough Answers with Yossi Alpher - August 13, 2012. Today's News Nosh! Don't miss it! Israeli settlement of the West Bank is untenable, and framing it as inevitable just makes matters worse. In honor of the Ninth of Av, my friend Yossi Sarid wrote a lamentation for the State of Israel. He included excerpts of the writings of another intellectual, Meron Benvenisti, who preceded Sarid in making gloomy predictions about Israel's future. Indeed, Israel of 2012 should be the subject of regret, as in "Weep sore for him who goes away" (Jeremiah 22:10). In this case, the ones going away are the passengers aboard the modern-day Titanic, better known as Israel, whose captains do not see the iceberg ahead if they stay on course. While the gloomy mood and sorrow in Sarid's essay are fully justified, his lamentation is based on two mistaken theories. Alpher discusses whether the terrorist incident in the Sinai on Sunday with the Egyptian soldiers is an internationally significant event, comments on Dani Dayan's opinion piece in the New York Times, and the dissonance between Netanyahu's government's policies and his quiet agreement with the Palestinian Authority to improve the PA's economic situation through more efficient cooperation. Continue reading Hard Questions, Tough Answers with Yossi Alpher - August 6, 2012. Note: Congress is now in recess until September 10 - which means the Round-Up is in recess until September 14. Continue reading Legislative Round-Up: week ending August 3, 2012. Last month saw an assault in Congress on Palestinian refugees--an effort to use legislation to re-define the Palestinian refugee issue out of existence. This week the other shoe dropped, when a bipartisan group of members of Congress introduced a new bill embracing the cause of "Jewish refugees from Arab countries" in a way that Congress has never replicated on the Palestinian side (for more info, see this list of all bills/resolutions dealing with Palestinian and/or Jewish refugees since 1989). On August 2nd, 2012, Yedioth Ahronoth (Hebrew print edition) published a powerful article looking at the financial bonus that settlements enjoy compared to areas inside the Green Line. The article comes on the heels of Peace Now's publication of an analysis of the budget and a plan to save billions by reducing some benefits to settlements. The translation is by Israel News Today (INT). Yedioth Ahronoth (p. 4) by Gad Lior and Yuval Karni -- While the middle class is bowing under the weight of rising taxes and an expected cutback in the budget of the government ministries, Prime Minister Binyamin Netanyahu was asked about the special budgets transferred every year to the settlements. "These are negligible amounts," Netanyahu said, "it's a drop in the ocean." But an examination of the data shows that the amount in question reaches over NIS 1 billion per year--hardly a "negligible" amount. Continue reading The Israeli Government's Bonus for Settlements: NIS 1,059,988,790. The New York Times: Why Not in Vegas? I'll make this quick. I have one question and one observation about Mitt Romney's visit to Israel. The question is this: Since the whole trip was not about learning anything but about how to satisfy the political whims of the right-wing, super pro-Bibi Netanyahu, American Jewish casino magnate Sheldon Adelson, why didn't they just do the whole thing in Las Vegas? I mean, it was all about money anyway -- how much Romney would abase himself by saying whatever the Israeli right wanted to hear and how big a jackpot of donations Adelson would shower on the Romney campaign in return. Really, Vegas would have been so much more appropriate than Jerusalem. They could have constructed a plastic Wailing Wall and saved so much on gas.